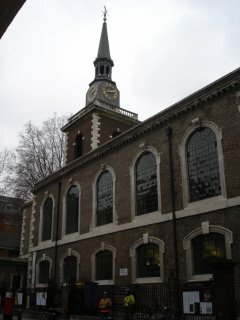 Had "business" in London yesterday. Can't say where, with whom, or what about yet, but the organic biscuits were delicious. 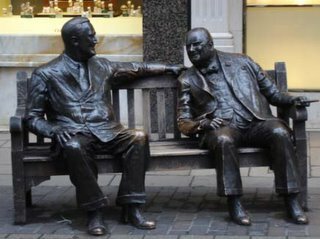 As I walked down Bond Street, I passed this statue of Winston Churchill and Franklin Roosevelt. I always admire it for the characters it portrays so well, but seldom do the two gentlemen have the seat to themselves - there is usually a tourist of some kind sitting in the middle. Yesterday morning, however, they were able to chat face to face, and I was pleased to take their photograph. 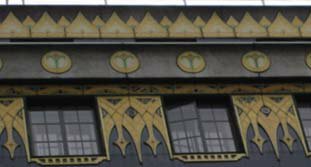 Over in Great Marlborough Street, I finally got to take a photograph of the art deco facade I've meant to have a close look at for ages, having seen it in a book but never noticed it whilst walking past. Of course, my eyes are normally fixed on Liberty's window! 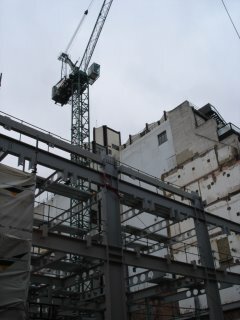 But look up above the Caffe Uno shopfront and a beautiful architectural feature is revealed. Finally, standing in a doorway in Jermyn Street, having come out of the back door of Waterstones bookshop, I stood in the doorway of a shirtmakers to put up my umbrella and spotted these two sights (sites), which stand next door to one another. I thought the contrast so great that it was worthy of (two) photographs! With hindsight, I should have taken one of the join as well. Returning to my blog entry several years later to remind myself that of course, I was at St James Palace, enrolling a new member of the WI.